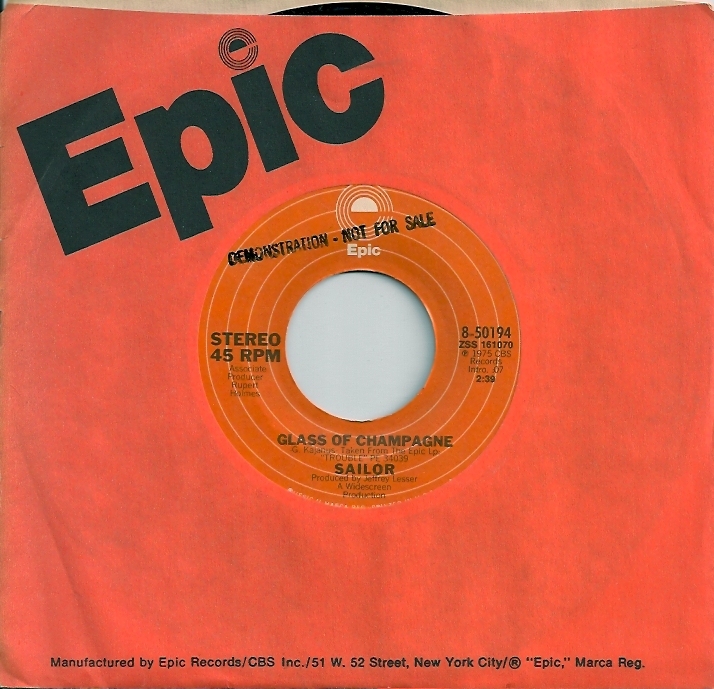 An almost religious combination of then current Roxy Music and as well, Sparks signature keyboard style, Sailor’s ‘Glass Of Champagne’ made it to #2 during December ’75 in the UK, most likely because it was hard to avoid instant addiction to the song’s commercial synth heroin. Predating acid house daytime pop by easily fifteen years, the well produced, major label, manufactured sound of Sailor was not a problem in my world. Along with Chicory Tip from two years prior, and a few others, the eventual demise of guitar rock found it’s early footing in hits like this. Producer Rupert Holmes has become a bit of an unsung hero. I just never hear him being credited when the mainstream print media are celebrating themselves and others, you know like yearly Q Awards and things. Seems they always honor groundbreaking producers, but I don’t recall Rupert Holmes ever getting a look. Hey, he produced Sparks’ BIG BEAT album, which includes some of their best material. That alone makes anyone with more. 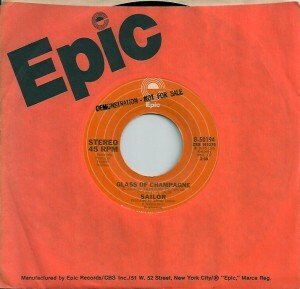 Having just succeeded the previous year (’74) with his own solo album on Epic, I wonder did he usher Sailor on to Epic or did the label see a fit between he and the band? Regardless, it worked. Sailor and ‘Glass Of Champagne’ have shrugged off all the dismissive poo-pooing over the years. In fact, I heard it being used last summer on a UK TV commercial for Marks & Spencer. Wow, did it grab you instantly. Don’t care if it’s thirty years old, a hit’s a hit’s a hit. This entry was posted on Saturday, October 22nd, 2011 at 2:24 am	and is filed under Chicory Tip, Epic, Q, Roxy Music, Rupert Holmes, Sailor, Sparks. You can follow any responses to this entry through the RSS 2.0 feed. Both comments and pings are currently closed.